The “Hill” at the Sydney Cricket Ground was where the hoi polloi gathered, Yabba with his warm beer and booming voice-“Send em down a piana an see if e can play that”-a tightly packed humanity, boys in shorts, men in suits-even the poorest of patrons, no matter what the weather would wear suits-down through the ages they had come to see the peoples batting heroes from NSW, from Charles Bannerman to Victor Trumper to Don Bradman to Dougie Walters. Well the “Hill” is no more, replaced years ago by concrete stands, and now an even more impressive 70 million dollar stand is set to inhabit the “Hill” area, but the people have not been forgotten for the stand will be named after one of their boys, a boy from the streets of Old Sydney Town itself. The most graceful of all Australian batsmen, Victor Trumper. Victor Trumper was born in 1877, out of wedlock which was quite a scandal at the time. Two of his three biographers did not mention the fact out of respect for the man, the second Ashley Mallett on advice from Sir Donald Bradman. Like Bradman later; he dominated at school and junior cricket so much so that many schools and teams refused to play against the young Victor. He was coached by Charles Bannerman the scorer of the first Test century in the year Trumper was born, but Bannerman found him a tough student. He was never rude or disrespectful, he would listen very carefully to all of the advice, but to the frustration of his coach he would then go away and continue to bat in his own effective manner. It was every young Australian cricketers dream to “go home” as a member of an Australian cricket team. After a couple of years playing Sheffield Shield he was an outside chance to make the 1899 tour of England, but was not considered consistent enough and was left out of the touring team. At the last moment he was added to the touring party after a fine performance against the Australian team (they often played games in Australia before they left to raise money for the trip). Originally he was to be paid only a half share, with the rest of the team on full share terms. At the time the players financed the entire tour of England and would split the profits at the end, sometimes this would be a small fortune. The arrangements did not change fully until 1912, when the Australian Board of Control (now known as Cricket Australia) took charge. 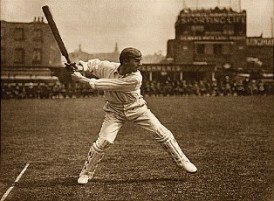 The captain of the 1899 tour Joe Darling was so impressed with the batting of the young Trumper that he would ask whether Trumper was on board the Cab that would take the players from their hotel to the ground, if the answer was yes, he would say “drive on”, no matter which other players were running late. Trumper made four tours of England, his most memorable was that of 1902 when he scored a record eleven centuries during the tour, his highest score was only 126, this was because after he scored a ton, he would throw his wicket away unless his side was desperate for more runs. In the Fourth Test of the 1902 season he played a great innings when he scored a century before lunch on the first day of the Test, a feat which has only be achieved by three other players in the history of Test cricket. The pitch was very wet, as in those days the pitch was not covered, and the fast bowlers could not bowl as their run-ups were also left to the elements. It was vital for the Australian team to score their runs quickly before the sun came out and turned the pitch into a sticky wicket. “What could I do? He kept hitting them into the practice ground, I couldn?t very well have had a man fielding in the bloody practice ground, now could I?”. Australia went on to win this match by just three runs, which gave them the Ashes, despite England winning the last match by one wicket. There had never been or would there be a more exciting Ashes series for over 100 years until 2005. The greatest cricket writer Neville Cardus was a young boy in 1902 and Trumper was his favourite player, he would say in his prayers at night “Please God let Trumper score a century tomorrow, out of a total of 137 all out”. It was said that Trumper had three shots for every ball and could not/would not play the same shot on consecutive occasions, he was at his best on “sticky” wickets, and would seemingly play in just the same effortless manner, while his team-mates struggled to lay bat on ball. His greatest contemporary rival for best batsman in the Australian team Clem Hill said “as a batsman, I am not fit to lick Vics boots”. A poor businessman Trumper was so trusting and kind hearted he often made very poor investment choices. For awhile he owned a sports store and would do things like taking a bat out of the store, score a century in a Test match, and then sell it for half price because it was used. When kids would come into the shop to buy a composite ball (real cricket balls were very expensive) he would sell them a real ball for the same price as the composite ball, plus throw in a bat and stumps. Trumper liked to feel the bat, and would only wear a glove on his bottom hand, and even this glove he would cut out the palm so he could feel the bat handle. In 1912 Trumper pulled out of the Australian tour of England along with five other leading players. He was upset that the players were not allowed to select their own manager as promised by the Board of Control. In 1915 Trumper died of Brights disease (a very painful death), he was 37 and for one day the news of the war was pushed off the front page of Australian newspapers. He died poor, leaving an estate valued at just five pounds, a far cry from the earning potential of the best batsman of current times. Frustratingly there is very little footage of Trumper left; just a posed leg glance and a couple of cut shots. Probably the most evocative image of Trumper is the posed photo taken by the greatest sports photographer of the age G.W. Beldham. It shows Trumper meters out of his crease, front foot elevated, hands at the very top of the bat ala Adam Gilchrist, and the bat high above his head, you can just imagine him driving that ball into the practice ground. With a Test average of under forty stats can not capture the awe and style of Victor Trumper. His Test record has led to some dismissing him as not relevant when discussing the greatest batsman in the history of Test cricket. Take a look at another Aussie great in this exclusive new video released by the Bradman Foundation.